We are ISO 17025 Accredited!! 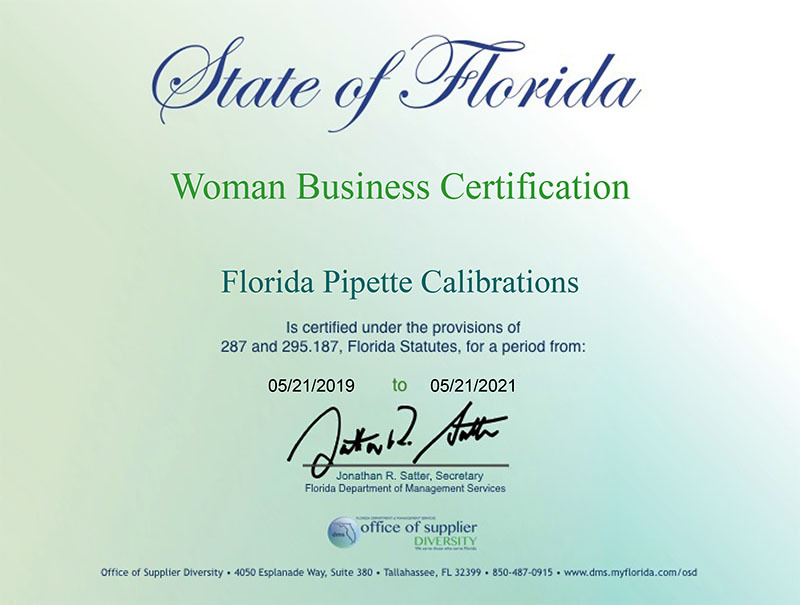 Florida Pipette Calibrations has built a reputation in Florida on our technical ability, customer service, professionalism and reliability. 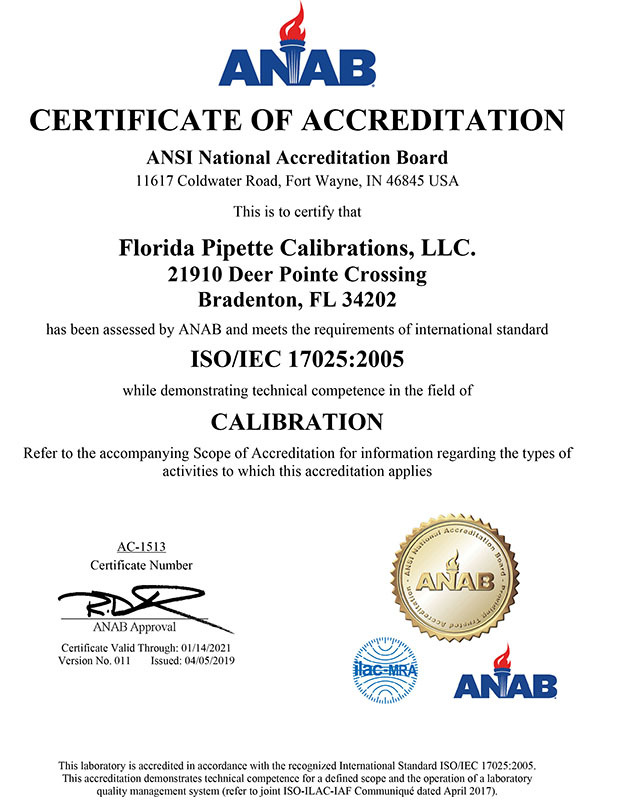 As an ISO 17025 Accredited business we have achieved an “elite Accreditation” with only a handful of companies throughout the US able to provide On-Site ISO 17025 Accredited Pipette Calibrations. 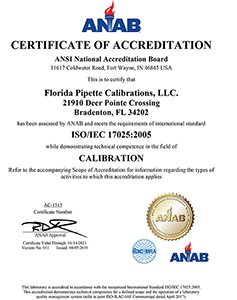 We are certified competent, by ANAB, ANSI-ASQ National Accreditation Board, having the technical ability to service your pipettes, and a definite Quality System in place. We perform On-Site ISO Accredited Pipette Calibrations in Florida and nationwide. It is The International Standard for lab calibrations. It certifies that a company has been externally assessed and found to be competent in the consistency of approach through the Quality System, in developing, implementing and improving the effectiveness of a quality management system that enhances customer satisfaction by meeting customer needs. So whether or not you require ISO Accredited Pipette Calibrations…..you definitely require competence in the company that services your pipettes. You can’t afford to take any chances. So……if you are not using us, how do you know the company you are using is competent? What type of certification do they have? Ask them, then call us! 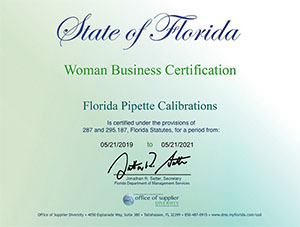 We are certified by the State of Florida as a Women Owned small business that cares about small business. Prior to starting Florida Pipette Calibrations, Debbie worked for 10 years as a Technical Manager and Senior Technician, performing On Site Pipette Calibration & Repairs in the Maryland, DC Metropolitan area. The warm climate brought Debbie here, and in 2005 started Florida Pipette Calibrations. We received our ISO 17025 Accreditation in 2010 and we have been servicing customers in Florida, the US and Internationally. With my Amazing Team, we have built a reputable company, based on our quality Technical Service and Customer Service……….. and we look forward to the opportunity to meet you! We are a Florida Certified Woman Owned Company servicing the whole state of Florida!! Some of our customers include Scripps, Sanford-Burnham Medical Research Institute, Mayo Clinic, MD Cancer Institute, USDA, U. Miami, UF, UCF, FAU, FIU, USF,and Florida State. Servicing Laboratories and Institutions since 1997.